Discover how to radiate Almighty God Who lives within! Jesus Calls Us to Abide in Him (Jn. 15), So Let's Learn How! The Great Mystery of the New Testament is that we no longer live, but that it is Christ in us Who lives His life through us. We are not expected to push the darkness of sin out of our lives, nor are we able to do so. Instead, we allow the light of Christ’s presence to shine in every area of our hearts, and out through us into the world. The supernatural power of God becomes the normal, natural life of the believer. How do we naturally let Jesus live through us? How do we “abide in Christ” (or “let go and let God”)? How do we move from “self-consciousness” to “Christ-consciousness”? Are you satisfied that you are living the "abundant life" Jesus offers? Do you "grow weary in well-doing," regularly trying with all your might to resist the power of sin and live a good Christian life? Do you sometimes feel like only the strong-willed can be "overcomers"? Would you describe your Christian life as one of "rest"? Do you ever wonder if maybe we are missing something in the Gospel message that New Testament believers knew? If so, this training is for you. It is time for you to release Christ continuously, effortlessly and powerfully! In this series you will discover how to return to God’s original design for mankind as was demonstrated by Adam and Eve in the Garden of Eden. 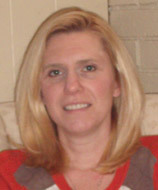 Four key truths are discussed in the three sessions, and two journaling times are included in the training experience. This course radically changed my life in every way possible. When once the Christian life was somewhat of a duty and chore, it is now a lifestyle of rest. What was once my trying to be good for the Lord is now having Him be good out through me. What was striving to serve Him in every aspect of my life is now simply loving Him and yielding to His Spirit to live out of me. By understanding, experiencing and living out the revelation truth of abiding, my life in every way and dimension has been radically changed. How This Training Module Will Bring You Into the Abiding Lifestyle! The most practical training series in the world teaching you how to abide in Christ! The books on the abiding in Christ theme are written by Mark Virkler, a left-brain, analytical, 21st century Westerner. He can clearly articulate the steps a person must take. What you can define, you can choose to do. Only two people in the Bible speak of abiding: King David and the apostle John. Therefore you choose to set your sights high! You understand it will require you to live differently. The process of radiating Christ is truly simple. The process is stated in easy-to-follow, down-to-earth steps. You choose to practice these simple steps so you can live naturally supernatural. You explore all verses that teach Who He is within you. You explore all His names so you know what He offers you. You explore various ways of tuning inward so you can touch this indwelling Christ. You explore the steps to releasing Him out through your being. This teaching is built squarely on the ability to hear God's voice and see vision. These abilities allow you to hear God daily in the garden. Life is experienced as ongoing intimacy with God, rather than a new theology about God. 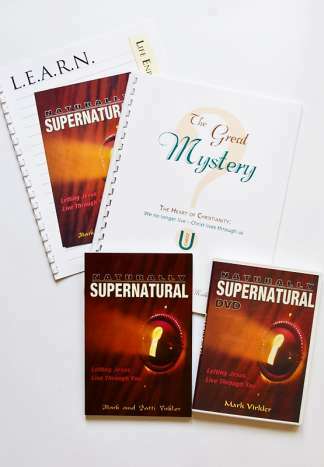 The LEARN Naturally Supernatural Notebook and CD/DVD make it even simpler. Ongoing revelation allowed the initial 7 truths to living naturally supernatural to be simplified to only 4 truths. Easier means it is now more livable than ever! Naturally Supernatural DVD Package Includes ALL These Amazing Resources! This is actually a workbook which guides you in meditating on hundreds of New Testament verses which speak of Who Christ is within us and how to touch and release Him and His wisdom, power and might continuously and effortlessly out through our lives. You look up every verse on being "in Christ," "in Him" and "in Whom." You meditate on the various names given to the Father, the Son and the Holy Spirit, and realize that all that He is is available within you, and even joined to you (1 Cor. 6:17)! Absolutely amazing! You gain revelation from the Holy Spirit as you meditate. Mark meditated on the verses in The Great Mystery for a year until the revelation he received was ready to flow out and share with others. While he was in Singapore, he taught in the evenings, but wrote during the day. For three straight days, he simply closed his eyes and typed, releasing the flow of revelation, and this book was born. It was his first truly right-brain book, which came exclusively from flow. It is a joy to read and constitutes a breakthrough in writing style for Mark. 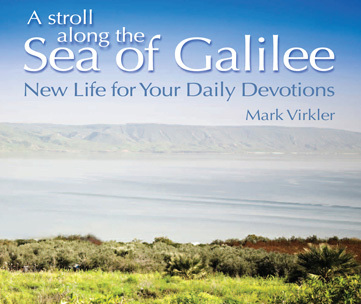 When he wrote this book, Mark saw seven truths for living naturally supernatural. Ongoing meditation and revelation has consolidated them into just four. This was taped in Toronto several years after the book Naturally Supernatural was written. God gave further revelation to Mark and the seven keys to living naturally supernatural were reduced down to only four truths, making the message simpler still. These are ideal for focused learning with the LEARN Naturally Supernatural notebook and for use in classroom settings. They are identical in content to the CDs. For maximum results, invite some friends into a home group or Sunday school class and watch the DVDs together. Practice the four truths weekly, sharing your results together. The DVDs bring an anointed trainer to your group, and your interpersonal sharing allows you to confirm that you truly are growing in your ability to abide in Christ! An unbeatable combination. 1-3 Work through the LEARN Naturally Supernatural notebook, watching the DVDs as instructed, doing the classroom activities, and the assigned homework. Come to class prepared to discuss your already completed written answers to the Introduction and Chapter One of The Great Mystery. 5 Come to class prepared to discuss your already completed written answers Chapter Two of The Great Mystery. 6 Come to class prepared to discuss your your already completed written answers to Chapter Three of The Great Mystery. Come to class prepared to discuss your already completed written answers to Chapters Four and Five of The Great Mystery. 8 Come to class prepared to discuss your already completed written answers to Chapter Six of The Great Mystery. 9 Come to class having read the Introduction and Chapters 1 and 2 of Naturally Supernatural. Be prepared to discuss your written answers to the "Think and Discuss" and "Journaling" sections. 10 Come to class having read Chapters 3-6 of Naturally Supernatural. Be prepared to discuss your written answers to the "Think and Discuss" and "Journaling" sections. 11 Come to class having read Chapters 7-9 of Naturally Supernatural. Be prepared to discuss your written answers to the "Think and Discuss" and "Journaling" sections. 12 Come to class having read Chapters 10-13 of Naturally Supernatural. Be prepared to discuss your written answers to the "Think and Discuss" and "Journaling" sections. Prior to taking the CLU course Naturally Supernatural, I had an incomplete understanding of abiding in Christ. First, I saw it as being situational acts of greater faith or better self-control. As things would heat up in my life, I would handle them through my own intelligence and abilities and then go to God for what was lacking in order to get through the stressful times. He was faithful to fill in the gaps, but as things would calm down, I would get back into my groove and go on with my life. I thought abiding was knowing that Christ was with me so I could turn to Him in my time of need; which is true, but it is not complete. The first step I took in attempting to master abiding was to allow myself a paradigm shift in my understanding of this topic and to accept that I was wrong. The greatest lesson I have learned through this course is that abiding in Christ doesn’t limit Him to come into the situations I feel I can’t handle on my own. Abiding means to live in intimate relationship – always and in everything. That was where I was failing. I had a degree of intimacy at times greater than other times. However, I am learning that there is such a depth of relationship with God that I have only touched on in some ways. There is so much more of Him to experience, and there is so much more of me that He could experience if I would simply surrender to Him completely. This lesson has been a long time coming, and I can see how God has prepared me for it through the sequence of previous CLU classes as well as the truths He has revealed in my personal Bible studies. But it hasn’t been easy. The roadblocks I have encountered have all centered around the wounds in my heart, for I had not allowed Christ to dwell in many closed off places. It has been very convenient to listen to the devil’s lies about who I was, am today, and where I am going; or more to the point, where I was not going. This is not abiding. Satan delighted in keeping me in a relationship that kept me broken and bound to him. If I am bound in any way, I am not free. The unhealed holes in my heart acted as a tracking device for the devil, allowing him to know exactly where I stood at all times. Another block that I encountered was not using the journaling I had been taught. I allowed fear to rationalize why I didn’t journal regularly. 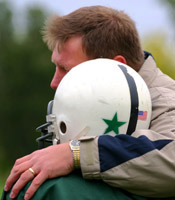 Fear said, “There isn’t enough time – it takes too long to settle down and listen. What if I don’t hear anything? How can I wait to get on with my day? What if I hear something that I don’t want to hear or see the broken places that bring back the pain I am trying to suppress?” The fear that I was failing somehow kept me from abiding as I should. I overcame fear by bringing to God my entire daily existence: the laundry; swimming in the pool with my kids; relating to my husband; grocery shopping; and the mental, emotional, and spiritual crises that try to pop up all day long. God was so patient with me! Not only did He teach me how to hear His voice through previous CLU classes but continued to teach me how to recognize the voice of fear. Naturally Supernatural brought everything full circle, and I was able to overcome this block by making the final decision to learn how to abide and to be committed to practicing that truth each day. I now give Christ the time each day and in various situations to speak openly to me without fear. It has been wonderful; for He has given me encouragement, told me how to pray for myself and others in a way I never would have prayed, and given me counsel on how to handle things coming up during the day. One day, He gave me a word that I couldn’t quite apply at that moment, but I put it on my radar for the upcoming day. Within a few hours I received a phone call that I could have reacted to in fear; but instead, I followed what He had told me earlier. Things went beautifully, and I had great peace when it passed. But I didn’t keep that word on my radar and a later event didn’t go so well since I started to take control again. Then I remembered my instruction and turned to Him for His perspective instead of my reasoning. By His guidance, it all worked out in the end. The most significant changes in my life are areas that were not huge obstacles, but the daily lifestyle changes in my eating habits and exercise routine. My previous “get it done” mentality put tons of pressure to change everything all at once and keep up a tremendous pace to accomplish my goal of losing weight. God’s goal for me was to partner with Him so that I would learn how to live in Him and how to allow Him to live in me. My mentality has turned from how I could make good choices to the perspective of what would we like to eat together? This made hearing His voice and counsel in times of temptation so much easier because now I am treating my body with respect as the temple of God. I experienced the same victory over my exercise routine. It is no longer a “work out” that I do to hit a magic number on the scale; it is an enjoyable activity that we do together. The victories I experience each day in my lifestyle changes have given me the confidence to allow God into those broken places of my heart to speak His truth, love, and healing. It hasn’t been easy; but each day, I have deliberately offered up and surrendered those places to Him as well as the fear that with healing comes the responsibility to walk in that healing. His heart is to love and nurture and heal. This, for me, is abiding in Christ. The "I" which wants so much to do things, even noble things, must be lost in Him (Jn. 3:30). I need to learn how to live out the truth that "I" don’t live anymore but it is Christ now living His life through me (Gal. 2:20). That surely demands a major transformation in the way I look at life and at myself. Since we learn so much more thoroughly when we discover a truth on our own, the book, The Great Mystery guides you in your own search. Naturally Supernatural contains the revelation presented for you in its full wonder and splendor. Buy both as a set. Research it for yourself first, and then let Mark Virkler add the revelation that God has given him to the revelation that God has given to you. I know of no greater truths than those expressed in Naturally Supernatural to bring you into true freedom in your Christian life. Problems may continue and circumstances may not immediately change, but you can be free in the midst of the storm through learning to walk in the reality of Christ living His life through you as your very life (Col. 3:3,4; Gal. 2:20; Phil. 1:21). Countless Christians we minister to in our ministry have been blessed, helped and changed by the clear, readable and highly biblical truths found in this book. Christians must learn to actually be the Christians they have become. This will happen, as you learn to live from your true in-Christ identity. If you are caught in the mire of a Romans 7 struggle, as was the Apostle Paul, where you are doing the very things you hate and struggling in your Christian life, this book will have a great and pronounced impact on your life. The following questions and answers on what it means to abide all the time helped to clear up the difference between abiding and communion for me. Lord, how does one abide all the time? "Do you recall Adam and Eve? I came and talked to them. Then I would leave and they would live in and out of the things I had spoken. That is what I desire. One carries on in life, living out of the words I have spoken to him, coming to Me whenever necessary and remaining open so I can speak to him whenever I desire." Lord, it seems like I operate in darkness then, and only occasionally walk in the full light. "Yes, in a sense you are in semi-darkness. However, in a sense you walk in the light, because that which you walk in is previous light, which when brought forth anew is light again." Lord, please explain "brought forth anew." "It is even as the process you are currently doing, reaching for a piece of information in the depths of your being, drawing it forth, re-crystallizing it, seeing how it fits, and allowing it to be adjusted to the present situation. It is light because I retrieve the right piece of information for the humble in heart. I position it. Therefore, it is light." Lord, but why not live in constant communion? "Because it is impossible for you. You were not built that way. To abide in the presence of your wife you do not constantly talk to her. In a spiritual sense you need not even always be physically together, simply aware of one another, concerned with one another's thoughts and reactions and considering her attitudes on the matter. That is abiding in her presence. And you see it does not necessitate seeing her or talking with her but is simply an inner awareness of her, and her thoughts, attitudes and responses." Lord, are "communion" and "abiding" the same? "Yes, in that they are both a flow of life. No, in that communion tends to involve communication, and abiding, simply awareness. Therefore, abiding is constant. Communion is intermittent. I would have you abide in Me constantly and commune with Me regularly." 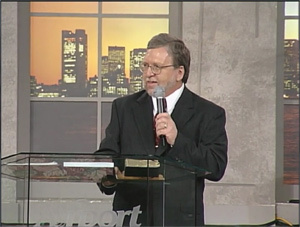 PowerPoints are available for those desiring to teach Naturally Supernatural. How to Walk by the Spirit – look up all 1200 verses on heart and s/Spirit, and gain a firm biblical understanding of how to define and live comfortably in your heart. Spirit Born Creativity – explores the five senses of your spirit, and how God fills all five senses to release a miracle out through you. Note: The Foundation to Naturally Supernatural is "4 Keys to Hearing God's Voice."